In addition to being a scientist, blogger, and a good friend of mine, Daniel Brown of BioChemicalSoul is also a very talented artist. His latest series is called “Ocean Invasions“, and they show marine animals entering the terrestrial world. One of the most recent pieces deals with my favorite subclass- Elasmobranchs! 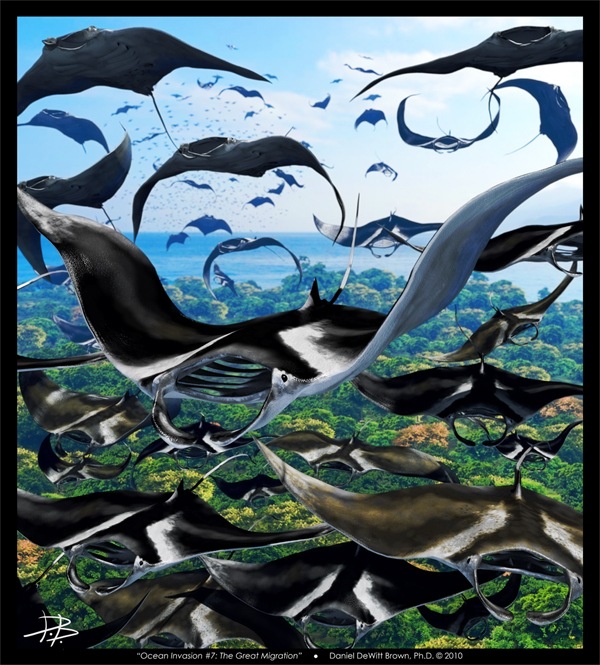 “The Great Migration” shows a group of manta rays flying over a forest. You can see the original here. Daniel reads this blog and would love to know what you think of his work! David, Thanks so much for linking to this David! I make this stuff as a hobby, so it’s really nice to have folks looking at it. I also like Octopus arborealus. Thanks for sharing! 1)The mantas at the top of the illustration are depicted as having a black underside. Most mantas have a white or gray coloration with black spots on their undersides. 2) I love the illustration. How do I obtain a print? 3) Where can I view the other illustrations you’ve created.